Home / Baby Bop / Barney / Barney & Friends / BJ / Mall of Asia Arena / Riff / SM Lifestyle Entertainment Inc. / Celebrate Barney's Birthday in an All-New Live Show! Celebrate Barney's Birthday in an All-New Live Show! Alex De Vera Dizon 3/24/2014 Baby Bop, Barney, Barney & Friends, BJ, Mall of Asia Arena, Riff, SM Lifestyle Entertainment Inc.
Join the loveable, huggable Barney & Friends as they sing and dance their way into our hearts in a new, interactive concert party this coming March 29 and 30, 2014 at the Mall of Asia Arena. Come and celebrate Barney's Birthday Bash! Celebrate with Barney on his birthday at this ‘super-dee-duper’ live on stage concert, featuring more than 25 much loved sing-along songs including "Mr. Knickerbocker," "Dino Dance," "Baby Bop Hop" and "Rock ‘n Roll Star." Children will be dancing in the aisles to contemporary cuts of old favorites "If You’re Happy and You Know It," "Wheels on the Bus" and "Itsy Bitsy Spider". A show which celebrates fun and friendship, don’t miss all the laughter of the party when BJ pretends to be a magician and Barney blows out his birthday candles on the biggest birthday cake ever. Like television's Emmy-award winning series Barney & Friend, this musical production encourages sharing, caring and imagination through the power of song, dance and the beloved cast of characters including dino pals Baby Bop, BJ and Riff. Barney’s Birthday Bash! is sure to entertain families and create cherished memories for years to come. The Emmy-award winning television series Barney & Friends has been trusted by parents and adored by children for more than 25 years and is one of the top-rated pre-school shows today. Tickets for Barney’s Birthday Bash are available in all SM TICKETS outlets located in all SM Cinema ticket booths. In partnership with SM Lifestyle Entertainment Inc. to provide quality family entertainment, e-PLUS Cardholders are treated to a 30% discount on tickets. For schedule and ticket information, visit www.smtickets.com or call (02) 470 2222. 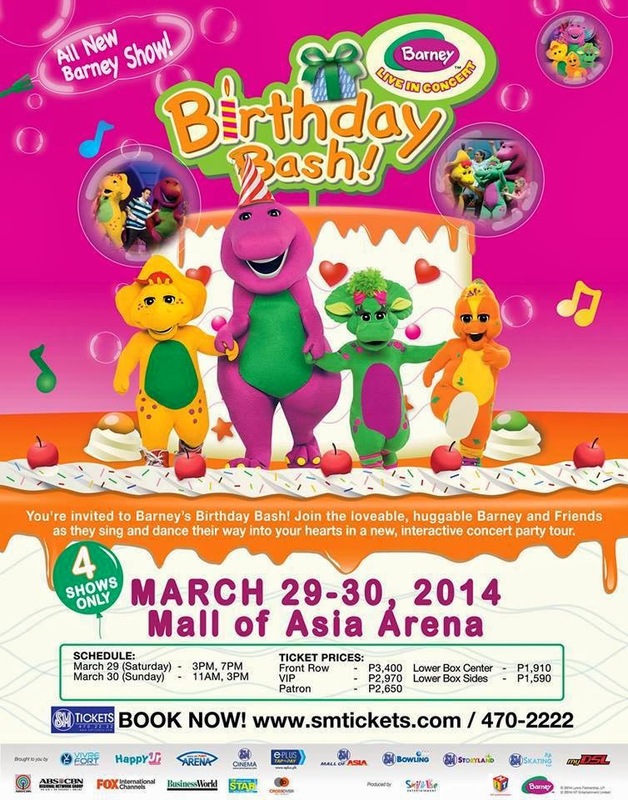 A limited number of Special Barney Meet & Greet Passes are also available to ticket holders of Barney’s Birthday Bash! To avail of a Meet & Greet Pass, contact Vivre Fort Entertainment at (02) 470 6956 or 668 9535. Barney’s Birthday Bash! is produced by Smile Live Entertainment and Hit Entertainment. The show is promoted in the Philippines by Vivre Fort Entertainment in cooperation with Mall of Asia Arena, SM Cinema, e-PLUS Tap to Pay, Businessworld, Philippine Star and 105.1 Crossover. Strictly 4 shows only, so don’t miss out! See you all there!